This is not just my signature dish, but may actually be the recipe on The Next Food Network Star that won me my own cooking show. The contestants were challenged to cook the ultimate dinner party meal for an incredibly esteemed group of chef-judges including Bobby Flay, Masaharu Morimoto, and François Payard. There were three finalists remaining and we had a sky-high budget to execute our menu. What did I make? My humble fifty-cents-a-serving Potato-Bacon Torte! It proved definitively that you can create something special enough to serve the country’s finest chefs while not spending an arm and a leg to make it. Preheat the oven to 375°F. Lightly dust your work surface with some flour. Remove one dough disk from the refrigerator, take it out of the bag, and set it on the floured surface. Roll the dough into a 10-inch circle that’s between 1/8 and 1/4 inch thick. Gently drape the dough over the rolling pin and lift it over and into a 9-inch pie plate. Fit the dough into the edges of the pan and set aside. To make the torte: Place the potatoes on a cutting board, peel them and halve them lengthwise, and then slice into 1/8- to 1/4-inch-thick half moons. Begin arranging the potatoes in the pie crust, rounded edges facing out, until you have a single layer of potatoes around the edges of the crust. Add another circle of potatoes in the center of the crust so you end up with a single layer of sliced potatoes that completely covers the bottom of the crust. Season the potatoes with one third of the tarragon, one third of the salt, and one third of the pepper. Repeat, seasoning between each layer, until you use all of the potatoes (you’ll probably have about 3 layers of potatoes). Roll the second dough disk into a 10-inch circle that’s between 1/8 and 1/4 inch thick, drape it over the rolling pin, and gently lay it over the top of the torte. Press down on the edges to seal and then crimp the edges by pinching them with your thumb and forefinger. Use a paring knife to make two or three small slits at the center of the top crust and place the torte on a rimmed baking sheet. While my butter and easy-to-make double crust makes pies, tarts, and tortes super special, I want to assure you that there is no shame in using a premade store-bought crust to make pies and tortes. Shortly after I had my twins, I made potato-bacon tortes for all of my neighbors as a holiday gift. I must have baked more than two dozen of them! I had four babies, all in diapers, and you know what? I bought my crusts premade. I won’t lie: the homemade butter crust really makes this torte sing. But even with a store-bought crust this savory pie is fantastic. 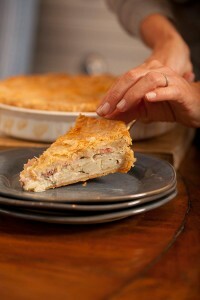 Just be sure to buy an unsweetened crust when using it to make a savory pie or torte. A few slits in the top crust of a pie or torte helps allow steam to escape so the hot filling doesn’t elbow through the top crust and leak out the sides. My mom used to carve steam vents in the shape of a guest’s initials into the top crust of her pies and tortes. It’s a heartfelt tradition that I proudly carry forth in my kitchen and you may want to adopt it, too. Reprinted from the book Ten Dollar Dinners. Copyright © 2012 by Melissa d’Arabian. Published by Clarkson Potter, a division of Random House, Inc.